On the morning of August 10, 1814, during a lull in the attack by the British on Stonington, Dean Gallup stood upon the shoulders of Jeremiah Holmes and nailed a large American flag to a pole above the battery. It was a banner of defiance that waved until the British sailed away on the afternoon of August 12, unsuccessful in their attempt to vanquish Stonington. The Stonington Battle Flag is considered by some to be the “little sister” of the Star-Spangled Banner, as they each survived a British attack within weeks of the other, with the bomb-ship Terror participating in both battles. Stonington’s flag of loosely woven wool bunting was sewn for the local militia, the 8th Company of the 30th Connecticut Regiment. It was also big, at approximately 12 feet by 18 feet, and would fly on a flag pole above annual training sessions and reviews. Local tradition maintains that ladies of a Congregational Church in town (it is not known exactly which one) produced the hand-sewn flag, probably between June 1796 and 1803. They took the unusual step of giving it 16 stars and stripes, even though after 1794 the US flag was by law required to have 15 stripes and 15 stars, one for each state. In 1796, when Tennessee became the 16th state, the sewing circle apparently anticipated the addition of both a star and a stripe. The official flag design did not change, however, until 1818, making this an unusual specimen. The United States and the United Kingdom signed the Treaty of Ghent in December 1814, ending the war. The flag remained in the care of Francis Amy, orderly sergeant of the 8th Company, until his death in 1863. The flag then passed to Nathan G. Smith. His daughter Caroline donated the flag to what is now the Stonington Historical Society in 1895 as that organization’s first artifact. Descriptions, pictures, and photographs indicate the flag continued to be used to celebrate dates of historic importance, and the flag was featured in the parade celebrating the 100th anniversary of the Battle of Stonington. 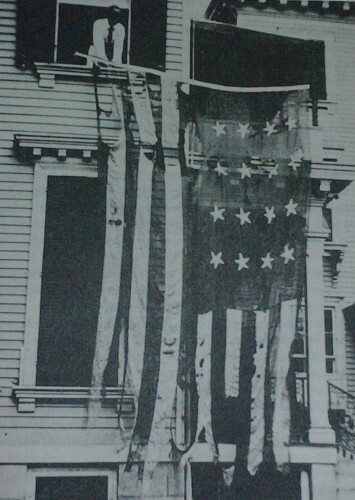 By 1948 the flag’s deteriorated condition compelled the historical society to contact flag preservationist Katherine Fowler Richey. Richey’s mother, Amelia Bold Fowler, described as “a genius in flag making” and “an expert needlewoman,” had patented a “Preserved Flag Display” system in 1913. Richey had learned her craft at her mother’s studio in Annapolis, where the Star-Spangled Banner received treatment in 1914. While concepts of proper textile conservation have changed markedly over the past 60 years, stitching the Stonington flag to linen in the mid-20th century may have contributed to its survival into the 21st century. A photograph taken in July 1949 shows the repaired flag hanging from a window on Water Street. By 1953 the flag was installed at the Ocean Bank Building on Cannon Square, where the two 18-pound cannons used in Stonington’s defense proudly pointed toward the sea. 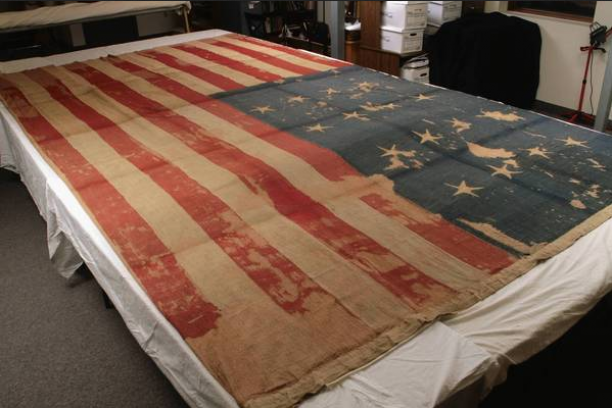 In 2003, the University of Rhode Island Textile Conservation Laboratory analyzed the flag, making recommendations for its continued storage and treatment. The flag today remains carefully stored at the Stonington Historical Society Woolworth Library. Susan J. Jerome, collections manager for the historic textile and costume collection at the University of Rhode Island, where she serves as adjunct faculty, also works in the interpretation department at Mystic Seaport. © Connecticut Explored. All rights reserved. This article originally appeared in Connecticut Explored (formerly Hog River Journal) Vol. 10/ No. 3, SUMMER 2012. “The Stonington Historical Society,” 2016. Link. De Kay, James T. The Battle of Stonington: Torpedoes, Submarines, and Rockets in the War of 1812. Annapolis, MD: Naval Institute Press, 1990. Trumbull, J. Hammond. The Defence of Stonington (Connecticut): Against a British Squadron, August 9th to 12th, 1814. Hartford, CT, 1864. Link.